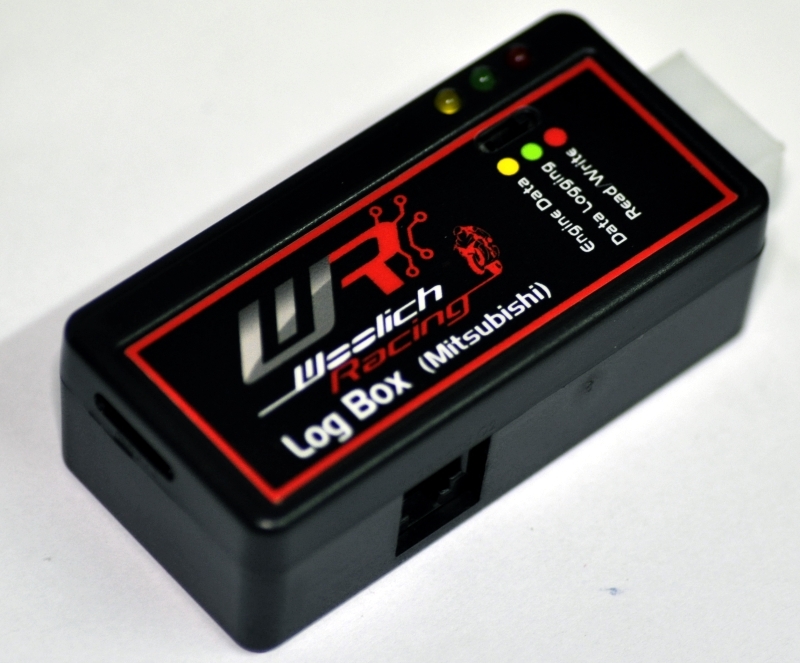 The Woolich Racing Log Box (Mitsubishi) (LBM) automatically logs engine data directly from stock Mitsubishi ECUs to an on-board micro SD card every time you ride your bike. The Log Box can be permanently installed on your bike. When you are ready to tune your bike you can connect a laptop to the Log Box via a standard USB cable. The Log Box appears as an external USB hard disk on your laptop and you can load the logged data directly into the Woolich Racing Tuned software to AutoTune your fuel maps. This allows you to tune your bike using data collected in real riding conditions with factors like Ram Air and other bike dynamics automatically accounted for resulting in an optimal tuning experience. The Log Box (Mitsubishi) LBM also allows you to Read/Write (Flash) the ECU and view real time Engine Data in the Woolich Racing Tuned (WRT) software. The Log Box (Mitsubishi) uses the same electronics as the Log Box Pro (Mitsubishi) and includes a direct digital connection for Zeitronix Wideband O2 controllers. * The standard engine data connection speed vaires depending on manufacturer and model. Data is received from the Zeitronix every 20ms, linear interpolation is used to produce data logs between the engine data packets from the ECU. The User Guide for the Log Box (Mitsubishi) can be found on our User Guides and Installation Instructions page.